This gorgeous picture is Little House by Gilly Mound, who was my featured artist last week. 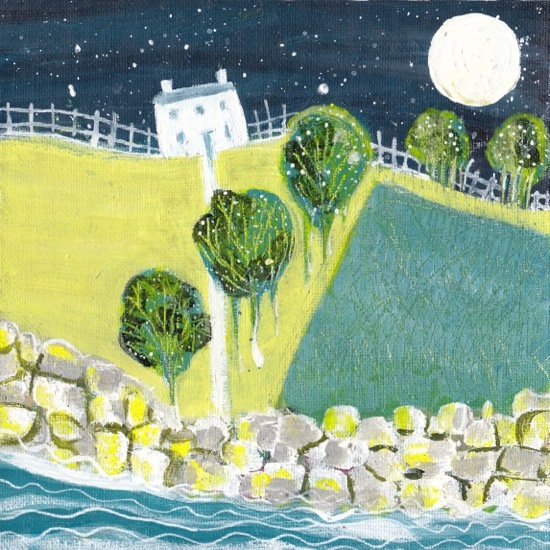 I love the house tilted beneath the moon and the sea rushing up to the garden wall as though considering dropping by. There’s something magical about the scene. I can almost hear the waves murmuring against the stones and the rustle of wind whispering through the trees! Write a few lines to describe who lives here. They’re clearly so fascinating that the sea and moon both want to visit.